Pauline, why did you choose to become an elite athlete? As a kid and young teenager I was not into any sport at all. I did like gymnastics and track we had for PE, but I was brought up in a nonathletic family; none of them were active at all. When I was 12 years old I started to starve myself and did that for 5 years. I was never fat; I was normal. But I was intrigued by the need for discipline and being in control of my own life, so I got very good at not eating. After 5 years I realized I was on the wrong path. I was miserable, but did not know what to do. During that time I found my first fitness magazine in the store; saw the muscular fitness model on the cover and got intrigued. I decided I wanted a muscular body, signed up for a gym membership, told the owner I’d be onstage 3 years later as a national champion. Said and done. I wanted to be an elite athlete because I am an all or nothing woman. Everything I do I do all the way or no way. I always knew I had what it takes. Nobody believed me – but I never believed the haters. One of my biggest goals in life was to move to America. However, doing that takes more than an “I want to come to America”. You need to show you can contribute to this country of dreams. So, being a professional model, athlete and TV personality was my way of getting here. There you have the reason why I chose to become an elite athlete. I wanted to live in California living my dream. What is one bad habit you had to overcome in becoming a fitness model and how did you do it? It took a lot of time to accept that there are no easy ways to stay lean; and this is a must to be successful in the model industry. No gigs wait around for you to diet down for photo shoots. You got to be ready each day on a constant stand-by in order to catch the opportunities. A lot of people who try to be in incredible shape year round get bitter because they feel deprived of being able to relax and enjoy good, tasty food. The key is to change your mindset from feeling like you are “missing out on life” to the feeling of “you chose and enjoy the path”. Nobody forces you to be lean; it’s a choice you and you only make. The bad habit of being angry due to the constant need to stay on a strict diet is the worst obstacle in being a fitness model. You got to let that go! Hunger is a sensation, you can control it. You just need to want to control it. Why did you seek out plastic surgery? As an athlete and a fitness model you strive to create a flawless physique, you use the weights and diet to sculpt shapes and curves. Every muscle on your body you can change and improve. But in order to see the beautiful shape the body needs to be lean with very little body fat. Here you face a Catch-22 moment because as your body gets more defined, your breasts start to sag! The tighter the body the droopier the chest. Why is that? Because the female breasts, that are such important parts to a perfect physique, are made up of mostly fat, which you cannot shape. No workouts, no diet pills will keep your chest full, the only option is to get a breast augmentation. I chose to go down that path since I strive to create and display that ideal, fit, strong body with curves, shape, muscle and femininity all combined into one human sculpture. Plastic surgery is the only option that enables this otherwise human physiology-wise unattainable body ideal. Being that your body is your business, what made you entrust Dr. Dickinson with your breast augmentation procedure? I was very concerned with what doctor I’d go with for the breast augmentation. I had met quite a few and I was always under the impression the doctor did not accept that I refused to gain body fat to make the breast implants look better. Since I am so lean it takes a special surgeon with a very good eye for details. The wrong kind of work could screw with my body symmetry. I remember I sat down with Dr. Dickinson. He drew sketches, showed pros and cons; he was straight, honest, and I felt no pressure on making up my mind. What really made me choose Dr. Dickinson was his way of assuring me he understood 100% how important the procedure was to me from a business perspective. It felt like I trusted him with my life. And if I remember correctly, I called so many times just to confirm we chose the right size and shape. And not one time did I feel like I was too demanding of a client! If you could change one behavior/belief of your clients, what would it be? I’d love to change the mindset of wanting everything to be easy. Getting in shape takes work, dedication and desire. There are no shortcuts. When you stop thinking of shaping up as a project with a time limit and instead see it as a life-improving investment that is when you know you will reach your goals. Every day you must desire to do better, you must keep the drive, the intensity. You must believe doing so is the true and only path to success. You are a very driven woman; how do you keep your passion focused? I am only great at doing things I am passionate about, so it is a life survival mechanism. It’s a waste of time to spend hours and days on matters you don’t care for. You live only once. You have one time to make an impact, to influence people, to inspire. And that is what my purpose is: to inspire. I feed that passion by sharing my passion and not get frustrated when it feels like I give a lot more than I receive. The more you give of yourself the more comes back to you as positive energy. And that is what keeps me focused. Fighter Diet is my lifestyle concept. It’s a mindset, a notion, a way of approaching life. It’s a concept on how to get lean and stay lean without feeling like you are starving. The simple solution to stay in incredible shape is to eat because when you get really hungry you will sooner or later give in and indulge. What you do is follow the right diet strategies of preventive eating, as I call it. 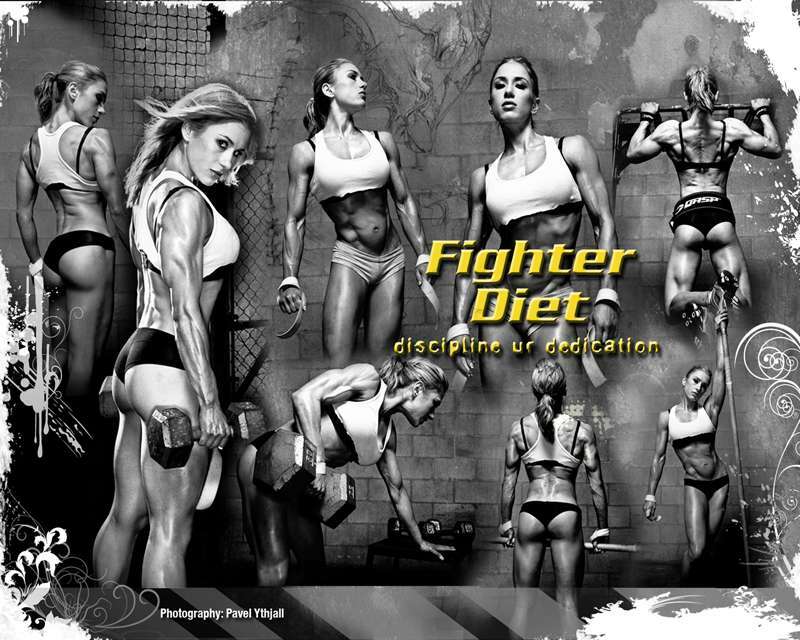 That is what Fighter Diet is all about. In your blog you discuss how it is difficult to find flattering clothing for muscular athletes. Do you have a clothing line on the horizon? As a matter of fact I do! There is a big need out there for athletes and athletic individuals who don’t look like the regular pear-shaped bodies that the industry seems to make clothing for. Muscles are like jewelry: you notice them. They need the right kind of outfit to look the best. I want to create clothing that flatters the human body’s form. And speaking of breasts, wow, what a huge need for good sport bras there is! Even with breast implants you need to protect the shape with a good sport bra. Yes I see a clothing line coming in the near future…. As well as a skin care line for athletes! Dr. Dickinson, what do you love about working with competitive athletes and fitness models? For models and athletes, their bodies are their business. They spend a lot of time and money perfecting their figures for performance and aesthetic reasons. It’s important that plastic surgery is a successful effort toward their goals and I get great satisfaction out of helping them achieve those goals. Working with models and athletes is also a welcome challenge because the stakes are higher. A poorly executed procedure could affect their careers and there is no room for error. Being able to help them take their physique and their confidence to the next level is incredibly gratifying as a surgeon. How did you first begin working with athletes and fitness models? Athletes and models make up my peer group outside the office because we all spend a lot of time in the gym. Working out is a passion of mine and obviously it’s an important part of every model and athlete’s life. Through this commonality, I understand what they need from me as a surgeon and what plastic surgery, particularly breast implants and augmentation, means to their careers. I understand that breast surgeries must enhance their look and performance. My training made it easy for me to meet their needs. What about your practice is most beneficial to fitness models? When I first started doing breast augmentation surgery, my primary clientele happened to be petite professional women who did not want an “augmented look”. A number of models that pursue breast augmentation surgery often require a very subtle increase in size as well as a very natural look. Too big of an implant or an obvious augmented look and they no longer are desirable by their agency. Achieving this aesthetic look was a part of my training as well as putting in larger high profile breast implants, which are ideal for women who want more volume but have a petite frame. Why do you think athletic and fit women choose you as their surgeon? As an athlete myself, I appreciate that female athletes want to be feminine as well as strong. While breast surgery is intended to enhance their natural beauty, it’s important that the implants themselves do not interfere with their performance and that the process minimally disrupts their training. My intention in breast enhancement procedures is to produce minimal trauma so women can experience little discomfort and return to activity with minimal downtime. Often, my patients return to cardiovascular exercise within one week. Finally, female fitness athletes and models want perfection and I work hard to deliver that. What is unique about your practice in general? Whether I’m dealing with a fitness model, a fine-tuned athlete, or a high-powered executive, I take the time to listen to my clients and discover what they want to achieve through their surgery. Every woman has an idea of how she wants her breasts to look: round, tear drop shape, more projection, broader base, soft, perky, etc. I help them discover what that look is, even if they don’t know how to express it themselves. Many surgeons don’t take this extra step; they discuss size and nothing more. Natural breasts vary on many more levels than just size and we can influence those elements through surgery. The result is a more natural look and a very satisfied client. Most importantly, women want their surgery to be done right. If we don’t get it right the first time, we correct it.